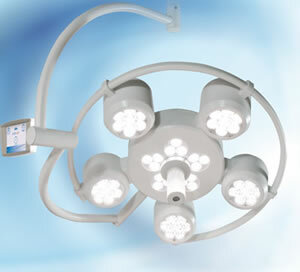 STARLED 5 is a surgical lamp made with LED technology born to meet the needs in the operating room guaranteeing excellent performance, precision, long life and consumption management. The revolutionary LED technology (light emitting diode) is the base of all the lamps of the STARLED Series. I–SENSE® revolutionary control system for a simple, fast and precise management. The high LED technology used by ACEM guarantees a light source in the operating room without emission of infrared rays to eliminate the heat under the lamp, preventing an increase in the temperature of the surgical area or the surgeons’ head. The 50 LEDs which make the STARLED 5 are circularly positioned around the handle, generating a light spot of 21 cm. at 1 meter with a high illumination level of 135.000 lux (160.000 lux optional) for a steady life cycle of 50.000 hours. The extraordinary and innovative combined system ACRIS® patented by ACEM ensures, by the use of a microprocessor, the control of electrical curves typical of LEDs to remain unaltered over the time but maintaining a life cycle of 50.000 hours. The colour rendering index of STARLED 5 is 95 with a colour temperature of 4.900 °K. These two values allow to reproduce the exact chromatic scale of the colours of the human body. Comfortable and light to move, thanks to the handle in the centre of the lamp, STARLED 5 is also practical for the medical team who can move it from the lateral handles assuring stability and constant illumination even during the movement. ACEM design takes into consideration sanitary requirements. For this reason STARLED 5 has been manufactured with a smooth and resistant material that makes cleaning quick, easy and complete. The lamp shape assures visual comfort and is particularly suitable for laminar flows. Its structure has been studied to avoid obstructing air flows inside the operating room reducing considerably the turbulence areas. In order to achieve a correct illumination according to the different needs STARLED 5 can produce a FOCUSED and AMBIENT light. The manual focusing system of the light field is easy-to-use thanks to a simple rotation of the central handle of the lamp. The easy-to-grip handle can be extracted and autoclaved and a fixed focus or zoom video camera can be fitted in on demand. AMBIENT light is assured by the LIGHT – UP® system. This technology created by ACEM consents a visual comfort as well as a correct vision of the environment. Thanks to its particular light beams coming from the upper part of the lamp, STARLED 5 is particularly suitable for minimally invasive surgery and is ideal for the preparation and treatment during the operation, monitoring of the patient and microscope operations. STARLED 5 can be supplied, on demand, with video camera integrated in the handle at the centre of the lamp, or positioned on a separate arm. STARLED 5 has different configurations: STARLED 5 double (twin dome) and STARLED 5 in combination with OT-STARLED 7. In both cases, the lamps can be supplied on demand with synchronized controls which grant simplicity of use saving time and giving the possibility of being managed by a single operator.